Union Station: "LA: City of Angels"
Civic Center Station: "In the Living Rock"
Pershing Square Station: "Neons for Pershing Square Station"
7th Street/Metro Center Station: "The Movies: Fantasies and Spectacles"
Los Angeles and film: two words that artist Joyce Kozloff obviously knew were inseparable. Culled from hundreds of films, the imagery Kozloff used in her two, narrow murals showcases the history of L.A.’s love affair with film. 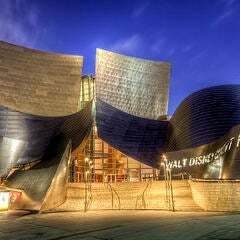 Among the genres Kozloff used are science fiction, Westerns, romances and historic movies. 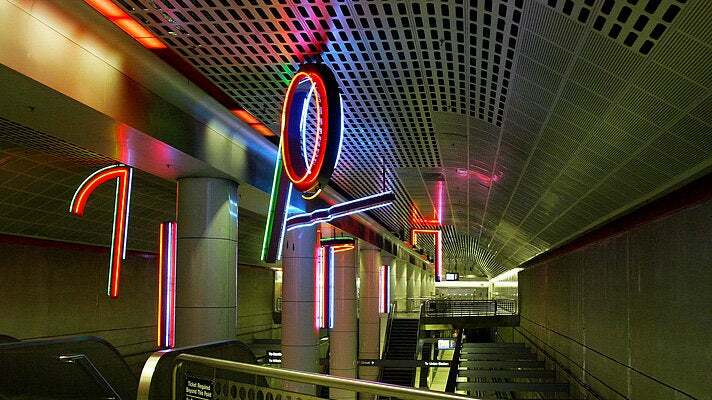 Photo Credit: 7th Street/Metro Center Station, The Movies: Fantasies and Spectacles, Joyce Kozloff, Artist. Courtesy of Metro ©2008 Los Angeles County Metropolitan Transportation Authority. Westlake/MacArthur Park Station: "El Sol/La Luna"
The intense colors of artist Francisco Letelier’s “El Sol/La Luna” reflect the dynamic community of MacArthur Park and reference its most recognized landmarks. At the core of the ceramic-tile murals are messages of hope, culture and a proud history of persistence — all apt descriptions of Los Angeles. Photo Credit: Westlake/MacArthur Park Station, El Sol/La Luna, Francisco Letelier, Artist. Courtesy of Metro ©2008 Los Angeles County Metropolitan Transportation Authority. Wilshire/Normandie Station: "Festival of Masks Parade"
The inspiration for this mural was a once-popular annual event, during which a flood of people would fill Wilshire Boulevard in a parade of masks, celebrating a wide range of cultures. Chinese, Korean, African, Native American — even movie cultures — were all represented in costumes and masks. Artist Frank Romero’s 60-foot-long mural portrays the parade in its entirety (its last vestige, since the festival hasn't been held in years), including Wilshire’s famed buildings such as the Brown Derby and the El Rey Theatre. Photo Credit: Wilshire/Normandie Station, Festival of Masks Parade, Frank Romero, Artist. 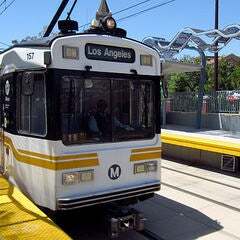 Courtesy of Metro ©2008 Los Angeles County Metropolitan Transportation Authority.